The Longan (or more dramatically Dragon Eye) is a small fruit similar to a Lychee native to Southeastern Asia. Believes to have a relaxing character in traditional medicine, it’s also common in modern Asian cuisine in soups and desserts. Lotus Leaves are another traditional medicine said to keep one’s heart healthy. The leaves are often drank as if a tea. And then there’s Poppy. More than just a bagel topping, it has healing abilities as well. There’s an unusual juxtaposition of branding and ingredients. While many brands might double down on the botanicals’ Asian provenance, Bulldog Gin instead cloaks it all in austerity and defiance. The Bulldog is an icon of British determination, and at times was used to describe Winston Churchill himself. Bulldog is distilled on a base of triple distilled British wheat base, pot distilled and then bottled at 40% ABV. The nose is slightly floral with lavender, juniper, and a bit of citrus. Some lime and a bit of sweet orange zest. The palate, despite the bounty of Asian botanicals reads more clearly in the traditional spirit. Heavy with angelica, especially mid-palate, the juniper is piney at first and a bit astringent towards the finish. Quiet floral notes whisper but remain as a distant backdrop. The finish has a bit of astringency again, rather medium-short in terms of flavor, it tapers quickly leaving a faint, slight alcohol ringing in the recesses of the palate. The spirit is rather mild, but also somewhat thin. Rather than coating the tongue and evolving, it fades rather quickly. The mild flavor means that Bulldog Gin isn’t going to be demanding attention in cocktails. It’s a good mixer in that it brings juniper, angelica and citrus to the cocktail but it won’t overpower other ingredients. Case and point, I think it adds a nice subtle juniper flavor to the Tom Collins, letting the lemon shine. In a Churchill Martini you can taste more of the botanicals. As you move along to a standard Martini, the Dry Vermouth almost becomes louder than the gin, and the Bulldog almost seems quieted with olive brine in a Dirty Martini. Bulldog Gin is at its best as a mixing gin, and it makes a good Gin and Tonic with almost any tonic. On the other side, it’s absolutely obscured in cocktails like the Negroni. The bar for gin has been raised significantly in the past decade. 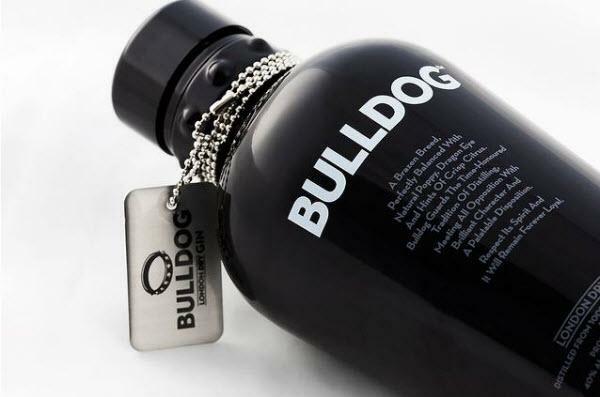 When it launched in 2007 there were far fewer gins doing what Bulldog is trying to do. Unfortunately, I don’t think it’s aged terribly well. The finish is short, and the curious choice of botanicals might escape even the most experienced gin taster if they weren’t called out on the bottle. Overall, Bulldog Gin is a fair gin at a fair price. Suitably acceptable for most everyday mixing needs for fans of classic style gins, it’s merely okay. I think you're review is fair but I'd say your rating is probably a bit low. I can't help but get raspberry notes from this gin which I find interesting. Only neat though as I agree that any cocktail is going to obscure some of the nuance of this gin. However, the Negroni is going to obscure many other highly rated gins as well. Halcyon gets a little killed in a Negroni. It's good, but you're missing things. Tanqueray No. 10 is the same. To say that Bulldog is a 2.5 star, on par with Burnett's is an interesting comparison. Don't get me wrong, I'm not a snob and I'll drink Burnett's in a gin and tonic without hesitation - it's a great gin for $10/fifth. But I won't drink it neat. Bulldog can be sipped neat and it's pretty good. Not overly complex but interesting enough. You've obviously made several tastings of this and have made up your mind so I'll respectfully disagree. I think 4 stars is fair in comparison to some others but I appreciate your reviews and comparisons. I think Bulldog was underrated here. I bought a bottle last night and would compare it to Hendricks in subtlety but not at all in flavor. I usually drink Tanquray as my go to gin but will enjoy this one on occasion. It's a great classic gin. It's subtlety is a virtue. I don't subscribe to the new wave of being bombarded by every kitch taste known to man. There is no juxtaposition in the name. It's solid, balanced, an iron fist in a velvet glove. We shall never surrender!!! Disagree sharply with your reviewer. This is the best gin this fifty-year gin drinker has ever experienced. Is a wonderful and complex/delicate gin served unmixed, except with possibly a good white vermouth. Boring! Nice and creamy but no kick. This is very good gin. I love this gin. Its a gin you can drink all night and never get tired of it, This is a party gin,but don’t think its not a quality gin by no means.